Life moves pretty fast, and we’re back to our regular monthly update on progress in Article 50. Maybe life moves too fast, because essentially there isn’t any progress to report, once again. 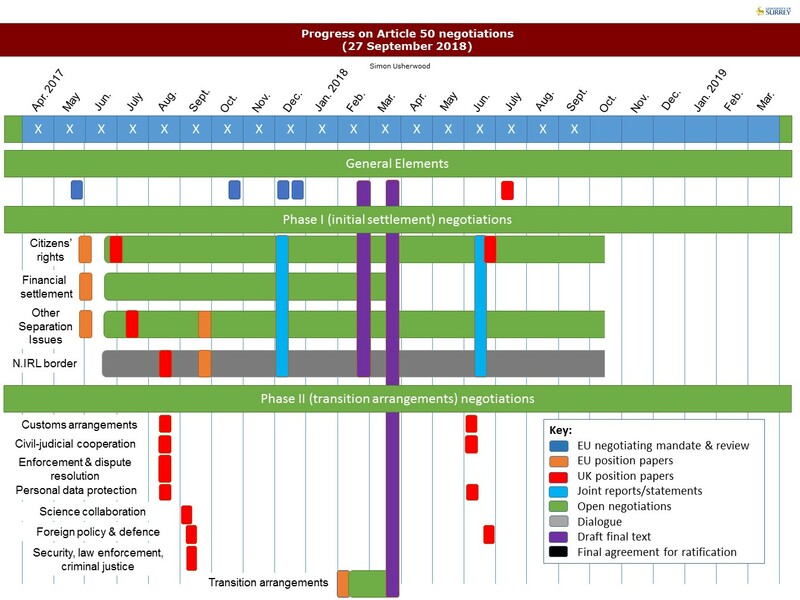 September certainly saw a lot of activity, in terms of meetings and discussion, but the underlying negotiations haven’t appreciable moved on, certainly around the remaining issues in the Withdrawal Agreement. Indeed, this was a key part of the Salzburg bust-up the other week: May did the tough-talking that might have been expected, but didn’t also bring any olive branch to show willing to get to a deal. As a result, the main impact of the past month has been to leave one month less to reach a deal. Consequently there has been a bit of an increase in the chances of a no-deal, although this still remains a possibility, rather than a likelihood. Interesting, it’s not just the UK side that drives this, but also the EU one too, in contrast to much of the past year: Salzburg did expose the tensions that exist in the EU camp and these shouldn’t be ignored. 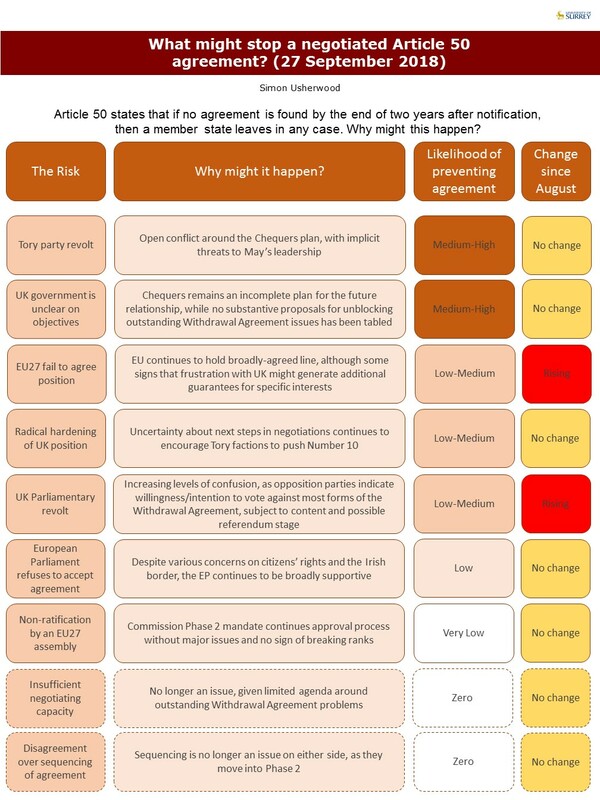 However, it’s clear that a no-deal outcome is still much more likely to result from UK-centric developments, something that is only likely to become more evident in the coming month. 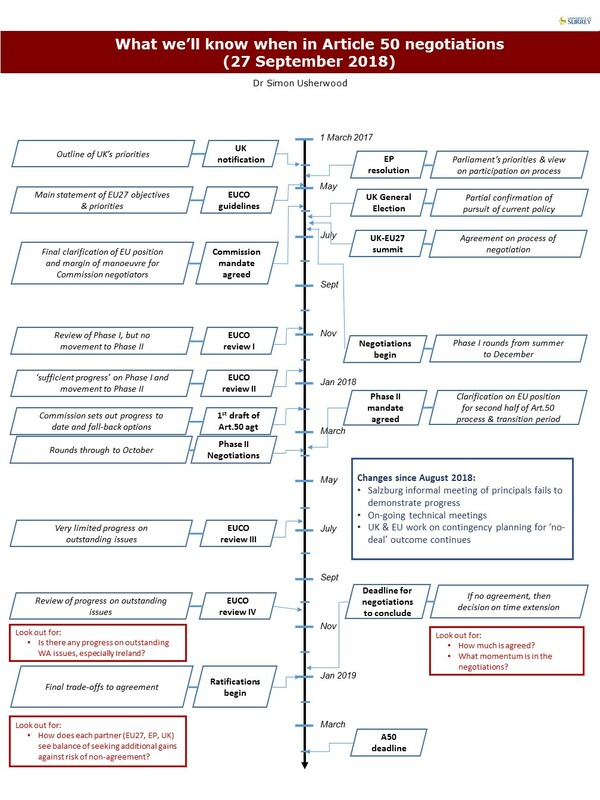 By the time of the next update, we should have a much clearer idea of how this is all going to pan out, since there’s once again an urgency to achieving progress for the October European Council.